This award-winning magazine provides news and analysis to inform wildlife professionals about advances in wildlife science, conservation, management, policy, and education. It features in-depth articles, summaries of relevant scientific papers, profiles of wildlife professionals, new field techniques, and more. An Editorial Advisory Board composed of members representing TWS Sections and Working Groups and at-large members guides the content of The Wildlife Professional. The board and the publication follow Rules of Governance to ensure that the magazine remains vital, informative and relevant to TWS members. 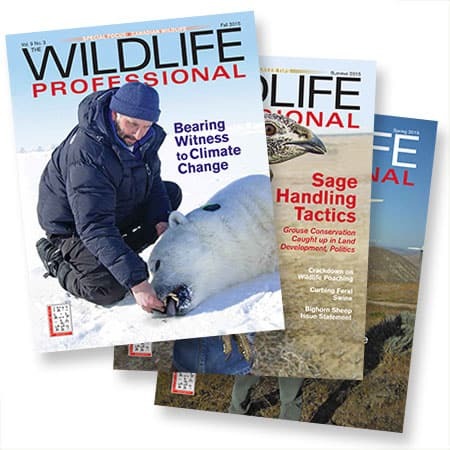 The Wildlife Professional publishes six issues per year. TWS membership includes a FREE subscription to The Wildlife Professional. The magazine is not available to nonmembers. Membership also includes FREE online access to TWS’ three journals (see below). Interested in submitting an article to The Wildlife Professional? Interested in reaching our members through an ad? The Journal of Wildlife Management, published since 1937, is one of the world’s leading scientific journals covering wildlife science, management and conservation. For general information, contact the journal’s editorial office. The Journal of Wildlife Management publishes eight issues per year. Interested in submitting an article to The Journal of Wildlife Management? TWS membership includes FREE online access to TWS’ three journals. Please contact our publisher, Wiley, for institutional subscriptions. Sign up for automatic table of contents delivery by email. Learn how to register for eTOC alerts here. Wiley offers an app in iTunes and Google Play. How to access your TWS member journal subscription with the app. Wildlife Monographs, published since 1958, are single-topic, peer-reviewed studies on specific problems and issues in wildlife science, management and conservation. Wildlife Monographs publishes at least one issue per year. Interested in submitting an article to Wildlife Monographs? Published in print from 1973 to 2006 and re-launched as an online-only journal in 2011, this peer-reviewed publication contains papers related to wildlife management, law enforcement, education, economics, administration, ethics and more. For general information, contact the bulletin’s editorial office. The Wildlife Society Bulletin publishes four issues per year. Interested in submitting an article to the Wildlife Society Bulletin? 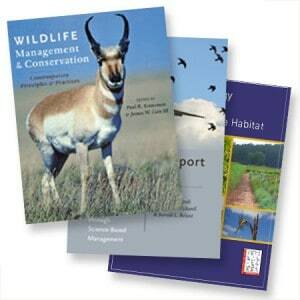 Our books cover a wide variety of topics related to wildlife management, conservation and policy. TWS members receive discounts on TWS books published by Johns Hopkins University Press and books from other publishers. Technical Reviews are scientific analyses related to prominent topics and issues in wildlife science, management, conservation and policy. Technical Reviews are written by panels of experts and are often used in preparing TWS position statements. Learn more here.